When you first open the box and pull out your iPad, you go through a series of steps and questions to set it up for first-time use. You can repeat this process later by restoring the iPad to factory default, which means the status of the iPad when it left the factory. This process wipes all data and settings from the iPad before restoring it to its pristine condition, which makes it a great, although destructive, troubleshooting step. 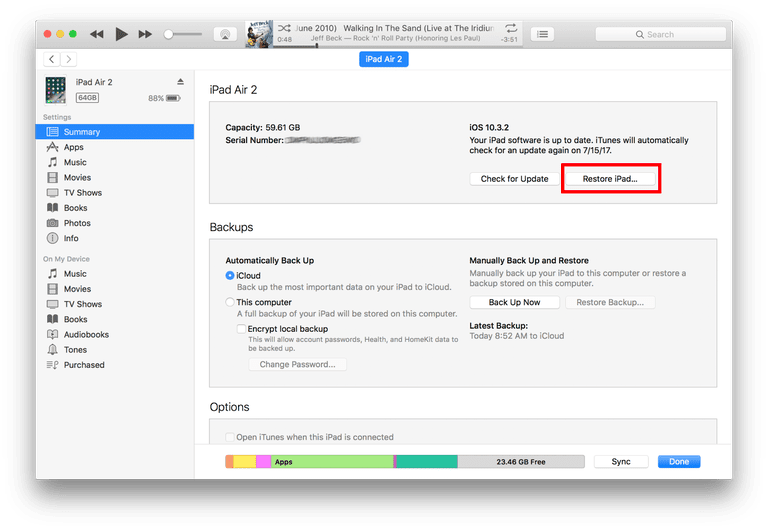 There are multiple ways to restore an iPad to factory default, including restoring it without even connecting it to iTunes. You can also restore it remotely, which is handy if you've managed to lock yourself out of your iPad. We'll concentrate on restoring it the old-fashioned way by using iTunes. Tap the Apple ID / iCloud button. The iCloud screen will show how much storage you have used and contains the various options for iCloud. Choose iCloud Backup to check for your most recent backup. In the Backup settings, you should see a button labeled Back Up Now. Just below this button is the last backup date and time. If it is not within the last day, you should tap the Back Up Now button to ensure you have a recent backup. Turn off Find My iPad before you can restore the iPad to factory default. Find My iPad keeps track of the iPad's location and allows you to lock the iPad remotely or play a sound to help locate it. The Find My iPad settings are also located in the Apple ID settings. First, Launch the Settings app if you don't still have it open. Choose iCloud from the Apple ID settings screen. Scroll down and tap Find My iPad to bring up the settings. Now that we have a recent backup and have turned off Find My iPad, we are ready to reset the iPad to factory default settings. Remember, this erases everything on the iPad and puts a fresh copy of the operating system, which makes it a great troubleshooting step for the iPad. The backup should restore all of your apps, music, movies, photos, and data. The iPad will show up under the devices tab on the left side of the screen. Select the device to see the settings using the Device icon at the top of the screen. It looks like a very small iPad. Tap this button to select the iPad. iTunes displays information about the device. The Restore iPad button is just below the operating system information. iTunes may prompt you to back up your iPad. If you have not already ensured that you have a recent backup, it's a good idea to do this now, but if you just performed a backup, this step is superfluous. iTunes confirms that you really want to restore it to the factory default settings. Choose Restore and Update. The process takes a few minutes, during which the iPad will reboot. When it's finished, the iPad will appear the same as when you first received it. The data has been erased and it is no longer tied to your iTunes account. If you are performing the restore as a troubleshooting step, you can now set up the iPad for use. What's Next After Restoring the iPad? You're free to restore your backup to the iPad, which will reload your documents, apps, contacts, and related information. However, if you merely use your device for light entertainment and web browsing, you may find some value in starting from scratch. Any apps you had previously purchased may be restored, individually, from the App Store.